This special issue of Comunicazioni sociali will analyze the gradual diffusion of several models of commercial TV throughout the decades into different nations across Europe. It aims to provide readers with an outline of the implications of commercialization at the social, cultural, institutional, political, textual and technological level, through case studies of individual nations or regions, comparative studies or theoretical analyses. Abstracts are invited for contributions to a special issue that will seek to further our understanding of the historical dynamics of TV commercialization that have differently shaped broadcasting systems in various European contexts: similarities and differences will emerge, contributing to a deeper comprehension both of European television histories and of the historical logics and developments of the medium. IBBT-SMIT-VUB organizes the Second International Symposium on Media innovations and the Private Television Conference in cooperation with the University of Oslo (Norway) on April 18-19, 2013. The Media Innovations Symposium explores how changing technologies, and changing modes of usage and engagement with media bring about innovation and transformation of the media industry and its policy. The second day will be a co-organization with the Private Television Conference and will be dedicated to innovations in the television broadcasting industry. Send your 750-word extended abstract to info@mediainnovations.be by 15 November 2012. Topics/sectors: innovating in formats; innovating in business models; innovating in delivery (trying to reach the consumer in new ways) ; innovating in consumption practices (new roles of users). Abstract acceptance will be announced in December 2012. Full paper deadline March 1st , 2013. The best paper award will be announced during the conference. 3. Call for papers: ‘Waste’. NECSUS is an international, open access, peer-reviewed journal of media studies published by Amsterdam University Press in partnership with NECS (European Network for Cinema and Media Studies). The journal is multidisciplinary and strives to bring together the best work in the field of media studies across the humanities and social sciences. 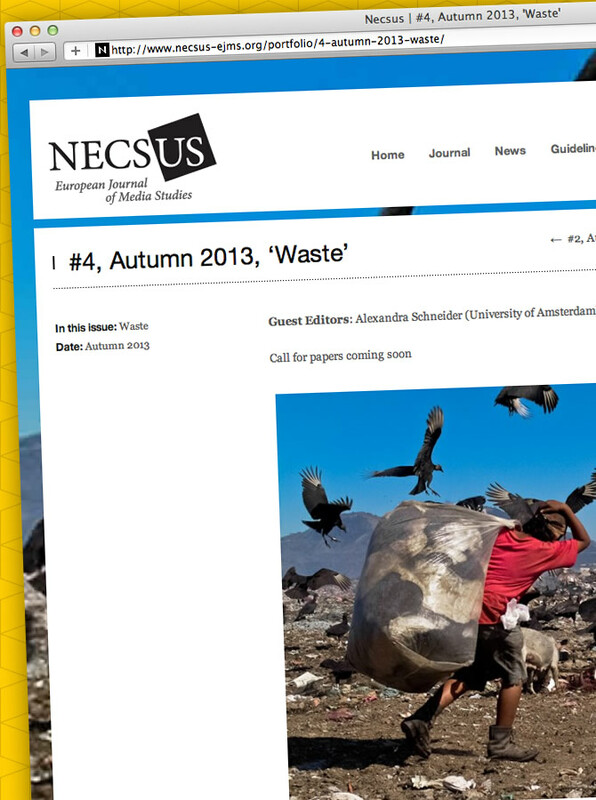 A special section of NECSUS will address the phenomenon of waste in the broad range of past and present media practices. We suggest to consider waste not only in terms of content or representation, but also and especially as a rhetoric, a method, or a strategy. At stake are issues such as the deterioration of film stock and VCR tapes, the future of dead media, the massive growth of electronic garbage, game consoles that can no longer be played due to the industry’s ‘planned obsolescence’, and the ephemerality of organic art. Waste is understood here in its multiple dimensions both as (everyday) matter and (conceptual) metaphor, as materiality and immateriality, as a socio-economical concern and artistic technique, and as repulsion and beauty. Topics may include, but will not be limited to the (renewed) tradition of found footage; the archiving of bits and pieces; the aesthetics of decay; obsolete media devices; e-waste; biodegradable art works and installations; the display and concealment of waste in various media. NECSUS looks forward to receiving abstracts of 500 words and a short bio of no more than 150 words by 1 December 2012 at the following address: g.decuir@aup.nl. NECSUS also continues to accept a wide variety of abstracts for both full-length essays and short reviews that may not be related to a special section theme.